Judy Kaiser, 70, of Waldo, stands in the cold in November 2011 in Searsport to protest a plan to build a large propane storage tank in town. 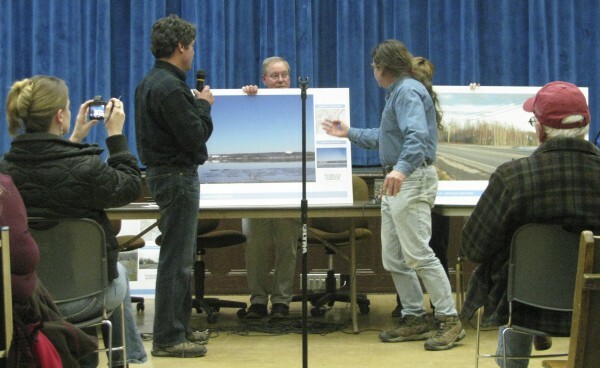 David Graham (left) of DCP Midstream debates the aesthetics of his company's proposed propane terminal project with Peter Taber (right) of Searsport in January 2012. SEARSPORT, Maine — The Searsport planning board expects to make a determination at Monday night’s regular meeting about whether an out-of-state company’s application to build a $40 million liquid propane gas terminal and storage tank has been completed. “Stuff seems to move along in starts and stops,” Bruce Probert, the longtime chairman of the Searsport planning board, said this weekend. DCP Midstream received its permit from the Maine fuel board last month, which the board had been awaiting, Probert said. The Denver-based fuel company also has received permits for the proposed terminal and 22.7 million gallon propane storage tank from the Maine Department of Environmental Protection, the U.S. Army Corps of Engineers and the U.S. Coast Guard. It now awaits approval from the town of Searsport. After the planning board accepts the application as complete and receives results from a couple of commissioned studies, officials will schedule several public hearings on the controversial project. One of the reports that board members are eager to look at is Good Harbor Consulting’s risk assessment of the project — a study that was commissioned in August by the Islesboro Islands Trust. The consulting firm is headed by former White House counterterrorism adviser Richard A. Clarke. Although neither the planning board nor the town of Searsport was involved in commissioning this report, Probert said officials will look it over. “Everyone would like to see it,” he said. Steve Miller of the Islesboro Island Trust said Good Harbor Consulting is “definitely in the middle” of the work right now. Analysts there have visited three other liquid propane gas facilities on the east coast, including Tampa, Fla., in order to evaluate the mechanisms of safe operations and compare them with the DCP Midstream proposal. His nonprofit organization and the Thanks But No Tank opposition group together sent the letter to the planning board members that alleges the application’s incompleteness. He said that there is uncertainty about whether the applicant — named as DCP Searsport, LLC — has demonstrated its financial capacity to meet the town’s performance standards for the project. He said there is a distinct difference between DCP Midstream and DCP Searsport. But Roz Elliott of DCP Midstream said Sunday that that’s not the case. “We’re more than able to show the financial capacity of DCP midstream for this project,” she said. Elliott said she expects the planning board to finish the completeness of the application Monday, and is looking forward to participating in the public hearings which will be scheduled in regards to the project. According to Probert, the planning board is looking into holding a week’s worth of public hearings in the Searsport District High School gymnasium in mid-November. “Once we hear about the public hearing, we’ll certainly make plans to be there and represent why this is a good thing for the town of Searsport, from jobs to taxes to community involvement,” Elliot said. That point of view is not shared by everyone, including Ken Agabian of Thanks But No Tank. He said his organization is awaiting the results of an appeal filed against the Maine Department of Environmental Protection in Kennebec County Superior Court on the grounds that the agency disregarded effects to the area’s scenic and environmental character when it granted a permit for the terminal project. 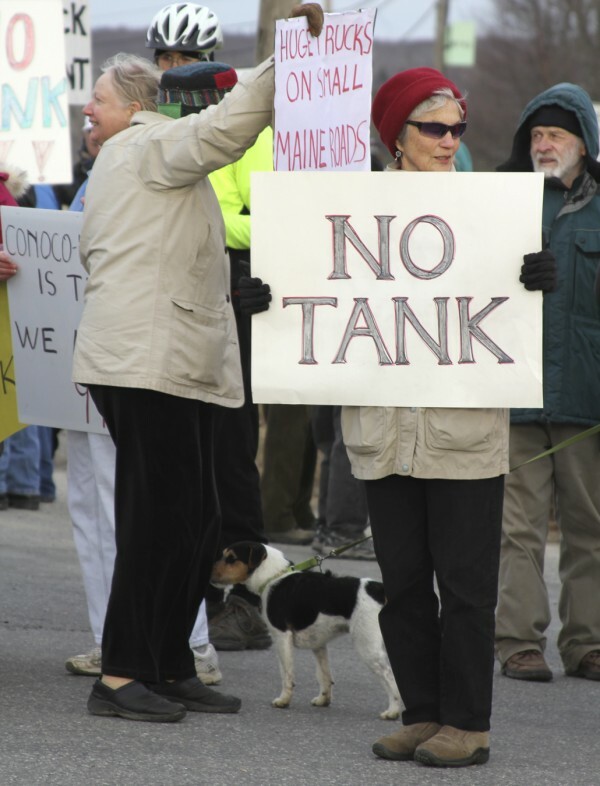 Volunteers also are working to do community outreach on safety and aesthetic concerns about the tank project and also to urge surrounding communities to request official standing as Searsport makes a decision. Communities that have voted to request official standing include Belfast, Camden and Islesboro. “We’re looking to find ways to slow up the project, using the levers that we have,” he said. The Searsport planning board will meet at 6:30 p.m. Monday, Oct. 8 at Union Hall in Searsport.